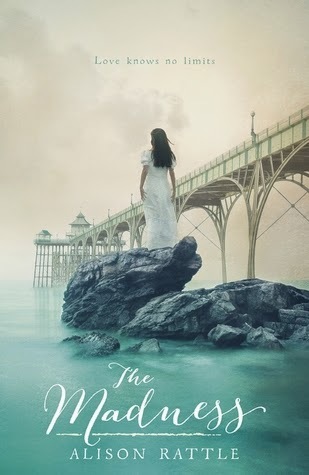 Marnie leads a lonely existence in a seaside village famed for its 'sea-cures'. Visitors flock from London every summer, but the ladies in their fancy clothes are like foreign creatures to Marnie. When she meets Noah she can see a future for herself for the first time. A future where she is no longer an outcast; a future of love and happiness. But Noah doesn't share Marnie's vision. He thinks they're simply having fun. Marnie has to make him understand that they are meant to be together; she has to make him see the truth...no matter what it takes. 'The Madness' is an unflinching and unsuspecting novel that is a must-read for all historical fans. What you assume is going to be a stereotypical teen romance is instead about a disabled young girl whose life has been affected by Polio. Rattle writes a perfect representation of what life was like in the 1800s, not just for the Ladies and Lords from London, but a girl who is discriminated due to her disability. Marnie is bullied and belittled, and thought of as a 'devil's child', because she is a cripple. Rattle is an author I cannot praise highly enough. She doesn't underestimate the reader, and writes what seems to be always avoided; a character with faults. With a new, fresh and exciting voice in YA Fiction, she tackles a novel about obsession. 'The Madness' is more than just a historical romance, instead, it's both raw and honest, dealing with how Marnie wants to be accepted into a town where she has always found herself on the vicinity. This novel is about obsession, but not about the type of 'mundane' ones we have, instead those that make your stomach church with anticipation. So, I think this would be a good time to talk about our main character, Marnie Gunn. It's difficult to describe such a character, apart from saying she is not necessarily likable. Id she was, I probably wouldn't have enjoyed this novel as much as I did. She's spiteful, not that you can blame her, yet spirited. Her character makes you keep turning the pages, even through sometimes you want to scream at her in frustration. With what appears to be a tough-demeanour, she is also desperate, struggling to contemplate life as a cripple, hoping that the 'sea-cure' will work. Denied affection for most of her life, the moment she has it, she doesn't want to let go. Can't let go. You understand why, though. But, even her parents laugh at the mention of someone taking an interest in their daughter. Noah himself is charming and caring, although he did take advantage of Marnie. Oblivious to how she really feels, he thinks they are just having fun, but it's not the case. His thoughts wonder to a girl back in London, as Rattle writes Noah's diary entries, switching from them to a third person narrative to write from Marnie's point-of-view. I loved this, as you saw the contrast between how Noah really felt, and how Marnie interpreted that. My only complaint is the age-gap between our two main characters. While Marnie is only fourteen, Noah is approaching eighteen, which made it difficult to picture a realistic relationship that would last. Thank you to Hot Key Books for providing me with a copy of this book in exchange for an honest review. Have you read 'The Madness'? Do you think enough tough-topics are dealt with in books? I hadn't heard of this before, but it sounds like something that I would like! Historical fiction is one of my favorites. Great review!